Founded in 1972 in Bangladesh by Sir Fazle Hasan Abed, BRAC has been working to prevent trafficking and human rights abuses through its Safe Migration Facilitation Center project of Advocacy Unit from 2006. 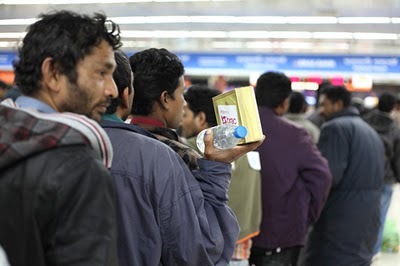 Now, at the request of the Government of Bangladesh BRAC is providing emergency food support at the Shahjalal International Airport, Dhaka, Bangladesh and creating a database of the Libyan returning migrant workers to link them with immediate relief and link them to future opportunities to start generating income for themselves and their families. You may have read the article today from BBC news about the more than 70,000 Bangladeshi migrant workers in Libya who’ve been caught up in the violent turmoil there. P.S. Click here to learn more about what BRAC is doing and to hear the stories of some of the returning migrant workers. Once you’ve made your gift, multiply it by forwarding this message to a friend. Posted on March 28, 2011 April 2, 2011 by NGO MigrationPosted in CausesTagged Aid, Bangladesh stranded in or fleeing Libya, Effort, Help Bangladesh Workers, Libya, Refugees, stranded.